For sale as a job lot is my accumulated airsoft rifles and parts as follows. Mauri MC51 / SBS this rifle is complete however could do with an upgrade. 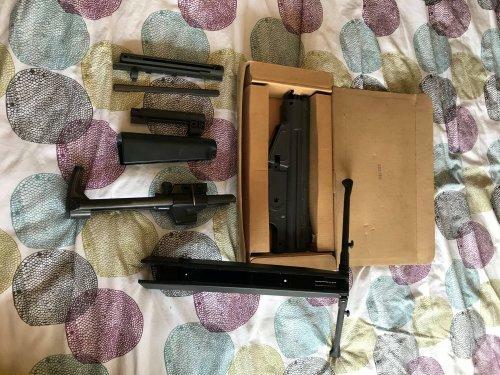 Various G3 spares almost enough to build another G3 - various stocks, fronts and bodies (all plastic Mauri) Mauri M16 A1 with replica 203 launcher - this is in parts as per photo and has some wear and tear Mauser sniper rifle - issue with cocking / trigger mechanism. Body of a Mauri M4 S System and box Various scopes, RIS iron sights and tighten barrel. There are also a small amount of other left overs from tinkering with rifles over the years. I am selling as spares / repairs / project rifles, my intention over the years had been to upgrade them, but i no longer have the time or the space. Any questions or further photos please let me know Collection from Haywards Heath, W. Sussex (due to the amount it would be quite expensive to ship).